Peter is a valuable project stakeholder. We need him more than he needs us. So, no matter what you do Peter puts your request to the bottom of his priority list. Dory is a project customer. She wants to get the results. Therefore, she puts quite a lot of stress on the team. Nevertheless, Dory wants to hear nothing of the difficulties on the project. She is not engaged as well. It freaks out even more. It may seem like there is nothing you can do about it. I will share some secret tricks that will help you to boost stakeholders’ engagement right away. You should never act as if a stakeholder does not want. That is wrong unless proven otherwise. Therefore, approach it from a position of mutual benefits. Even if a person acts somewhat aggressive, passive, or in any other unsuitable manner. It doesn’t mean that he or she is your enemy. You just have not discovered the cause of disengagement yet. Yeap, one of your requests is out there as well! People will disengage from your project in case they are overwhelmed with other tasks and projects. The simple example is when they are ignoring your requests. They just don’t have time for you. It is more complicated when a person has to answer to your requests due to a policy. But she still does not have spare time. She has dozens of such requests a day. In such case, a stakeholder may loop your request. Most likely you will get a bunch of rather stupid questions in return. Likewise, this person may drift to another topic with even more unrelated questions. To buy some time while you write another email answering a bunch of questions. Try playing on her terms. Ask for the most suitable day and time to work on your project. Plan it. Come prepared and with the most important topics. Have a focused working session. This case is difficult to differentiate from the rest accurately. People don’t like to show their weakness or lack of knowledge. So, they get creative. Once they got away from a project where they lack knowledge, it will be twice as hard to bring them back. In the majority of cases, you will notice an unusual buzz around “following the processes and policies” stuff. Also look for tunnel vision. Such stakeholders will insist on a proven solution only. Even if it doesn’t serve the project goal. These are the ways to cover ones back in case of a failure. Act as if they know nothing about the specifics of your project. Give the stakeholder all information even if he is a subject matter expert. He will tune in once he feels comfortable to suggest something. In no case do not act as if you know more in his area of expertise. Most likely it is not. Most likely, he just did get enough bandwidth to learn the specifics of your project. A stakeholder has nothing to gain from your project. The most common and the simplest of cases. There are many reasons to have a weak interest. Even high paid, central persons in the company often disengage because of little benefits. That is so common I’m sure you saw it many times. You may found something that will be interesting for such a stakeholder. You need to try to delegate it to her gently. However, do monitor her engagement. Interest may vanish in the middle of a project. It usually happens due to miscommunication or the lack of communication in the first place. You can also expect this case when a person has two or more bosses or managers. Both of them may have different expectations from your project. Therefore, they will put a lot of stress on the stakeholder you need to engage. Discovering the conflict is difficult. Especially when it comes to a higher level of the organizational hierarchy. The person in the center will try to get away from two powers until they solve the conflict. In most cases, you will be the third party to push on that stakeholder. It is your responsibility to protect your team from politics. 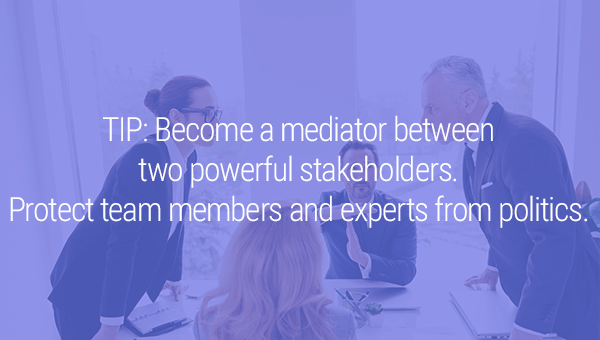 Become a mediator between parties that provide conflicting requests. Protect the stakeholder from the politics and clarify expectations and priorities. So, now you understand a reason for disengagement of a person. Though I would exercise extreme caution here. You may assume a wrong root cause of the problem. So, unless you are entirely sure, continue to explore the factors influencing the stakeholder. Next, you need to choose a correct way to build up engagement. After you identified stakeholders and performed analysis, we need to develop a strategic plan to build engagement. 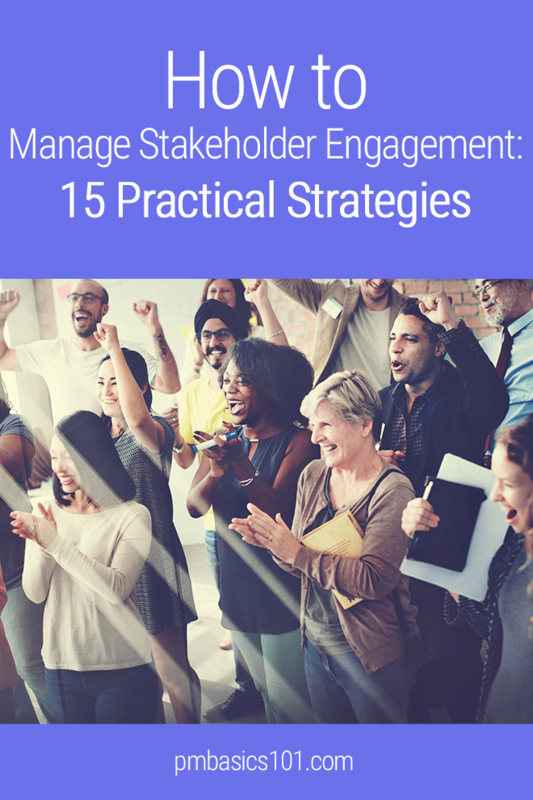 Your goal is to determine how to move each stakeholder from his current level of engagement to the desired one. 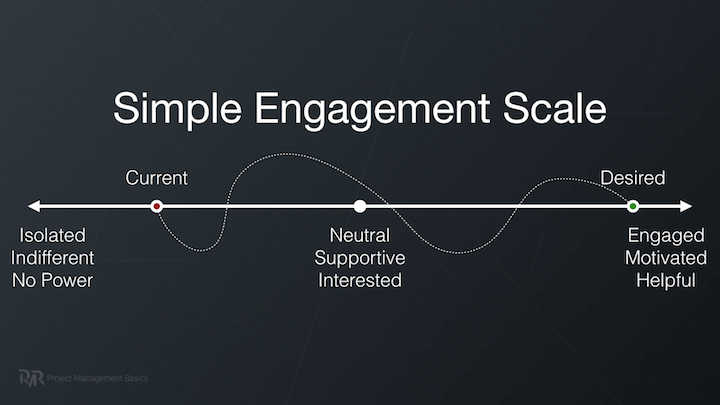 We are setting the current and desired engagement levels. The path is not universal or straight. It goes both ways. You may want to motivate a person to help with your project. Likewise, you may want to reduce the involvement and influence of a stakeholder. Nevertheless, it will not happen in an instance. Usually, it is a small project on its own. So, it all starts with stakeholder analysis. You simply must know who they are. What do they want and why. And you must have a plan. Did you notice professional psychologists in a movie? They always record their sessions, and they keep notes in the process. They test and verify the result. Test again and check whether there is a pattern. They are searching for an approach that will work for the person. That is the same way you should work on stakeholders engagement. Plan, do, check, correct. Plan, do, check, correct. I took the ideas, concepts, and patterns described below from Josh Kaufman’s book “The Personal MBA”. It is interesting to notice that these ideas are present in the PMBOK Guide to some extent. They are incorporated into practices and techniques, but I think it is useful to stress them out explicitly. I strongly recommend you to read Josh Kaufman’s book. It will be a great addition to your skills that help to influence stakeholders and build lasting relations. A trade-off is a practical application of a triple project constraint of scope, costs, and time. Every time a stakeholder wants to do something he makes a trade-off of not doing something else. It is the concept that you should teach each stakeholder. Moreover, you should be able to draw a line and stand your ground to prove this concept on a daily basis. A change of the project scope. A part of the project, its delivery or a work package should be removed or modified. Additional resources. You must get more money to get more workforce or equipment. A change to the schedule. Milestones and deadlines should be moved to include new work. This concept is quite transparent during the initiation of the project and planning process. Implementing an additional requirement obviously requires more time and resources. However, it gets crucial when it comes to changes after the project start. Teaching the trade-off helps to influence stakeholders and their understanding of processes on the project. Take a look at it from a stakeholder’s perspective. For example, during the execution phase, a stakeholder (let us assume he is a customer) asks to make a small change to the scope of the project. It is quite expected, and you are even prepared for that. And you agree to integrate the change saying nothing. Then he asks for the second, third and fourth time. Now you put your schedule and your team on the stretch. It will be hard but still possible to meet deadlines. Then comes a fifth change request. You obviously see that there is no way to fit it into your schedule, and only now you start to negotiate a trade-off. It might seem like the previous four change requests does not require trade-offs. 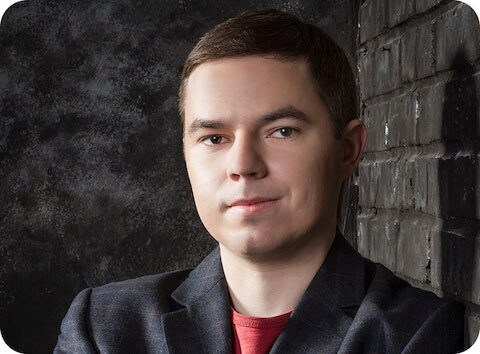 You gave away your schedule slack, maybe some risk reserves and, therefore, increased a risk level for the project. Additionally, you put your team under stress, which may influence their motivation. Assuming that you did not clearly communicate the concept of the trade-offs and the actual consequences of the first four change requests, the stakeholder may not take it easy. He made four changes without a problem before. But now, one more “simple” request cannot be integrated. Moreover, the project is at significant risk. Now you and the stakeholder can’t reach an agreement. 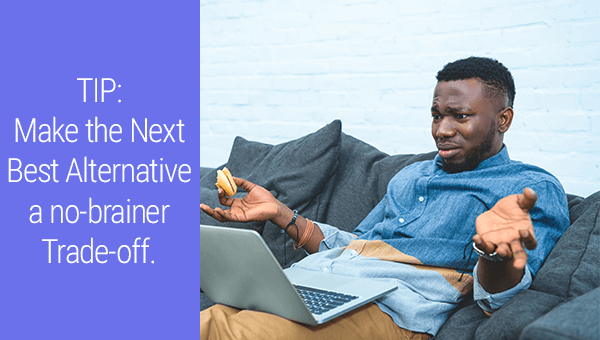 Your customer will search for the next best alternative. Given that he doesn’t believe (or understand) you, his next best alternative is to force you to integrate the change into the project. Either directly or via your management. While trying to please the customer and make him happy, you will have to include the change without a trade-off. Usually, it will be put on you as a business and client satisfaction matter. Most probably your organization wants to preserve long and beneficial relationships. Especially if it costs only a “bit” of stress for you and your team. Such misunderstandings happen way too often. Some clients intentionally use this unfair practice to get as much as possible for what they paid. But let’s assume a more positive case. What would be the best next alternative? Push stakeholders to a better decision with the Next Best Alternative. Each part of the project has a different value for a stakeholder. Each functional requirement, characteristic, or trait of the end product also has its value. A stakeholder can calculate the monetary value of delivering a requirement. However, he operates with a perceived value. It is an amount of resources, time and money he is willing to give for a piece of work. Quite often a perceived value and real costs differ. To sync a perceived value with the reality of how a project produces a product (and value). How do costs add up and how much time and efforts each piece of work requires. Visualising the plan and the end result. Removing stakeholders hassle in the process as much as possible. Ensuring that everything is under control. Making a stakeholder feel good and look good in the eyes of others when he accepts your offer. In general, you need to focus on the most significant benefit of your alternative suggestion. This way you can influence stakeholders and make their decisions more predictable. “Absence Blindness is a cognitive bias that prevents us from identifying what we can’t observe”, as Josh Kaufman states in his book. This human trait has a great impact in many areas of project management. Both stakeholders and project managers have a hard time identifying better approaches once they have selected one. While everything works fine, we tend to become blind to new problems until they appear. To overcome absence blindness, for example, we have a separate set of processes and techniques in Risk Management that help to identify things that we do not see right away. We, project managers, are usually underappreciated due to absence blindness. The greatest gauge of a good project management is when nothing serious happens, and the project runs smoothly. But most people tend to miss that it happens this way because you have prevented all the bad things. It may seem like a project gets finished in time and within budget while you are sitting doing nothing. Absence Blindness makes risk management, prevention in quality management, and process improvements less appealing. It is hard to see that these processes and activities beneficial because they produce absence. There is another problem the absence blindness creates. It makes people feel uncomfortable and out of control when you do nothing when something bad happens. In project management, it is often better to keep to the plan, and risk response plans to overcome problems. However, stakeholders usually tend to escalate problems when they do not see you doing everything possible to solve the problem right here and right now. That is why it is so important to keep stakeholders informed about upcoming risks. Absence Blindness is so widely spread that it appears in all aspects of project management and our life. The best way to overcome it is to create checklists. People hate losing things. Business people hate to lose opportunities even more. So quite often a loss aversion prevents stakeholders from making correct decisions. You will often see it when negotiating scope reductions. Even if a project success is at stake, it is very hard to convince stakeholders to give up a feature or functionality. Even worse. When a loss aversion is combined with absence blindness quality and risks reserves are usually cut first. Here is another concept that influences stakeholders. Sunk Costs are the investment of money, time and efforts that were spent and can’t be recovered. Customers and Sponsors are usually hard to give up sunk costs. So they try to invest even more resources in hope to get back what they have spent. However, sunk costs should not be taken into account when you decide whether you want to spend some more money. Only the final reward you expect is what matters. Always keep in mind that people tend to underestimate completion times. Even if you are doing everything by the book, there are uncertainties, risks, and interdependencies that you will not be aware of. Even if you are very accurate with estimates of separate tasks, time will flow in between activities and phases. You can spend a lot of efforts trying to predict every possible problem. However, not a single plan lived through the whole project without a change. I prefer to have a flexible plan that can withstand some reasonable amount of unexpected events without a need to make corrections. A plan should not be that detailed so it requires changes on a daily basis. It takes a lot of experience and authority to produce a plan that will be accepted by stakeholders and will have a good chance to be accurate. So for now, I would recommend you to integrate slack into your projects. Slack is just an empty period of time between two activities. It might sound controversial, but even activities on the Critical Path should have some slack. Slack seems like an unacceptable luxury in our world. Nevertheless, I suggest you to try to explain the concept to the stakeholders. It might secure your deadlines and make planning more realistic. Key stakeholders are usually busy people. They may be responsible for hundreds or thousands of employees, other stakeholders or users. Their mind is not capable of working with all these people on a personal level. So they tend to group them into “teams” and “projects”. It is not they are mean or cruel. It is just a limitation of our brains called the Cognitive Scope Limitation. Stakeholders put a lot of stress on a project team by setting unrealistic demands or pushing the deadlines. They try to achieve their goals. So, they tend to forget that “teams” and “projects” include people who have personal lives, hobbies, families and kids, their own objectives, needs, and problems. Stakeholders have not thought much about all of them. A human brain just doesn’t have enough mental capacity. Influence stakeholders by personalizing your team. The only way to influence stakeholders and overcome this problem is by personalizing your “project”. Use your team members names, put their photos as avatars in your communication tools, acquaint them with the key stakeholders and guard their personal time. Requirements are what a stakeholder wants you to do in your project. Expectations are what a stakeholder wishes to achieve or to get as a result of your project. Requirements vs. Expectations. 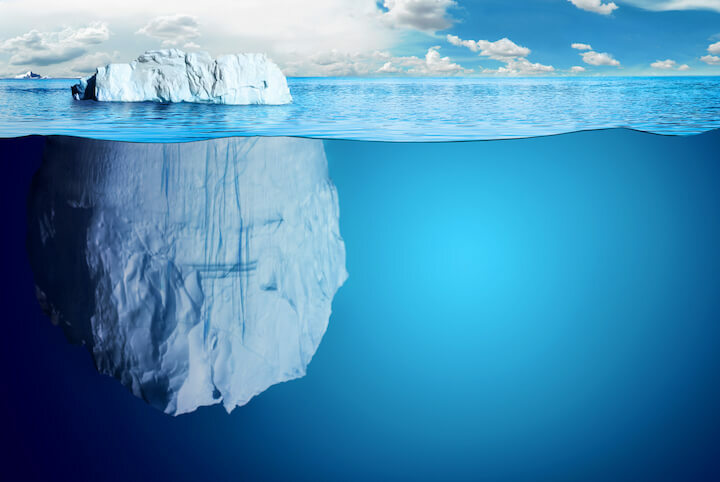 Guess what is on the surface. These are entirely different entries. They do not correlate. Let’s review the following example. From one side a requirement from a Quality Manager: “The project has to follow all the quality processes and policies by the latter”. Following the processes and policies will help the project to meet its goals. If they follow the processes and policies my involvement will be minimal. The project is risky. I don’t want to be personally involved. Let them follow standard processes and policies. If the project follows the processes and policies and it is successful I can get a promotion. The project must show good quality, otherwise, I might be fired. And the list may go on and on. The same requirement might have entirely different expectations. Relying on a guesswork usually results in false assumptions. They lead to wrong decisions. You need to define real expectations of each stakeholder and log them to the Stakeholder Register. Building stakeholders engagement around reaching the expectations is much easier. How important is to know that your junior team member is a close friend of CEO? How important is to know that several key stakeholders are translating the will of another person who is behind the scene? Would you plan and act differently knowing that the sponsor fully follows the suggestions of his CTO? Many stakeholders seem quite unimportant if you analyze them separately and out of context. However, if you dig deeper, you will soon see that all of them are interrelated and fall under the hierarchy of power in your or their organization. Most of them have superiors or peers that they want to impress or influence. All of them have friends, foes, allies, and associates. Some of them have shared goals. Once you have a clear picture of the relations between stakeholders, you will have a better chance to define real expectations. You will also gain a better position in any related negotiations. Understanding a real agenda and real influencers you can propose solutions that will be beneficial to all the parties. Otherwise, you will only be able to see the problem from the project’s point of view. 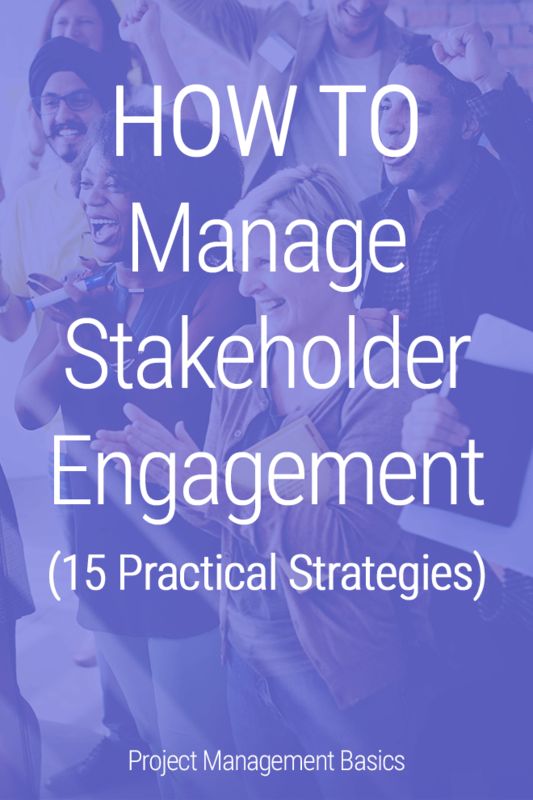 The most common mistake is to build engagement with a stakeholder only when you need it. You need to warm up their interest to the project continuously. 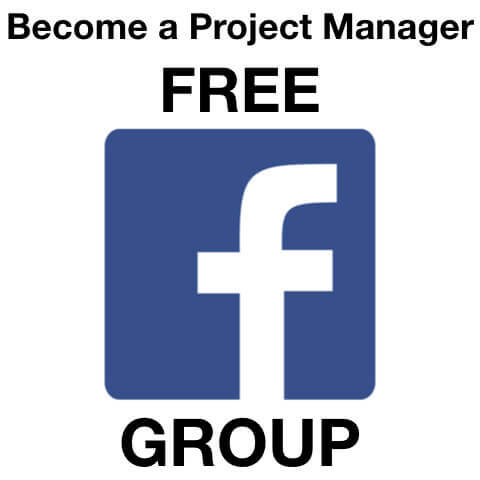 Keep them informed on the project progress, ask their opinion and ideas, invite to meetings. 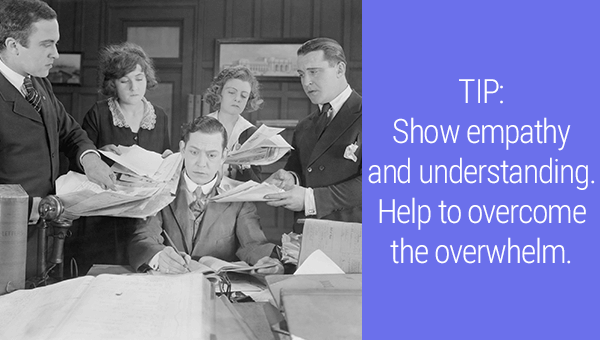 You don’t want to overwhelm stakeholders with all the information on the project. However, you do need to keep the door open for them to contribute. People don’t like to commit when they don’t feel control over the assigned task. A high-level expert is assigned to help you with a project. She is a top star in a department. Maybe she leads some projects on her own. However, on your project, you limit her abilities to only answering your questions. That is not as exciting as leading own project, is it? Therefore, sometimes you have to give away responsibility and control over a part of a project. To build engagement, stakeholders should feel the ownership for the work. Nevertheless, you are still interested in keeping overall control of the project. It goes without saying for the project team. Hopefully, you say “Thank you” every day. But what about a person who participated only partially? Do you remember to acknowledge the commitment of a person beyond your team? If not, that might be a reason why stakeholders do not want to engage with your projects. 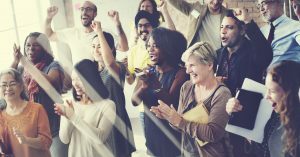 Gratitude is the key to building engagement in your project team. 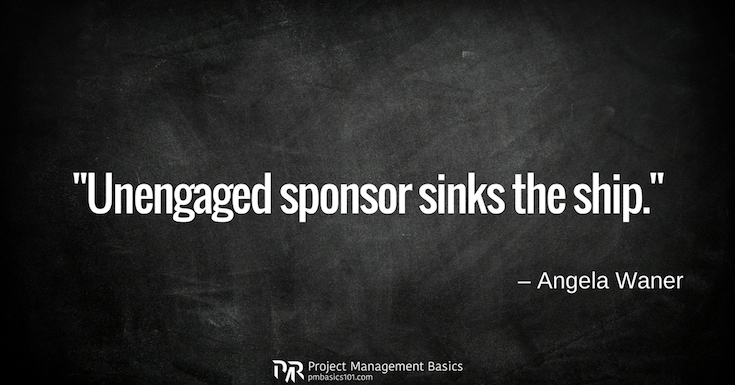 This tactic to build stakeholder engagement works well with top level ones like clients, sponsors, and customers. Whenever you communicate with this kind of stakeholders you describe the efforts, it takes to do the work. When the team works on a challenging task, say they are working hard and doing their best. When the team has to overtime, describe how committed they are. When you are working on creative tasks, tell how engaged the team is. They should understand that everything takes time, efforts and, in general, it is hard work. Stakeholders should see real people behind the work they request. They should feel commitment of the team. That will make stakeholders more reluctant to waste team’s time, delay answers, or to request unneeded changes. Also, it is hard to stay passive alongside such an engaged group of people committed to doing your project. It is mostly a mind game or partially an interview based activity. I like to approach this step as a “what if” analysis. I investigate the pros and cons of both active and passive scenarios. What if I send Peter a progress report in a full extent? What benefits will I get? He is a team leader, so he will be better informed and be aware of the situation. I hope it will make him more engaged. He may find some inconsistencies. But it may distract him and take his time. What if I don’t send him the report? I may lose some opportunities for his engagement, motivation and process improvement. So I will better send the report to him. What if I send the information directly to the customer without consulting with John? He is a leading subject matter expert. I have heard about his previous project a bit. Well, there is a probability that he will be upset. I really want to keep him engaged as much as possible. So I will better contact him in all cases. On the other hand, it may cause delays. So it is wise to plan communications well. This part of the stakeholder analysis is mostly used later to decide how to maintain the engagement level. All the information may go directly into a Stakeholder Register. The last thing I wanted to tell you about is a Call To Action. Whatever you communicate to stakeholders, you must direct them to the action you want. They can’t read your mind. You need to tell them exactly what you want them to do at the end of your message. It is better to have only one call to action per message. It will increase your chance to get the response you are looking for. Even if you do not expect any actions from a stakeholder, it is a good practice to give him a way to clarify things and ask questions. Invite him to write you back with any questions he might have as a call to action. It opens up a way for a constructive dialogue. 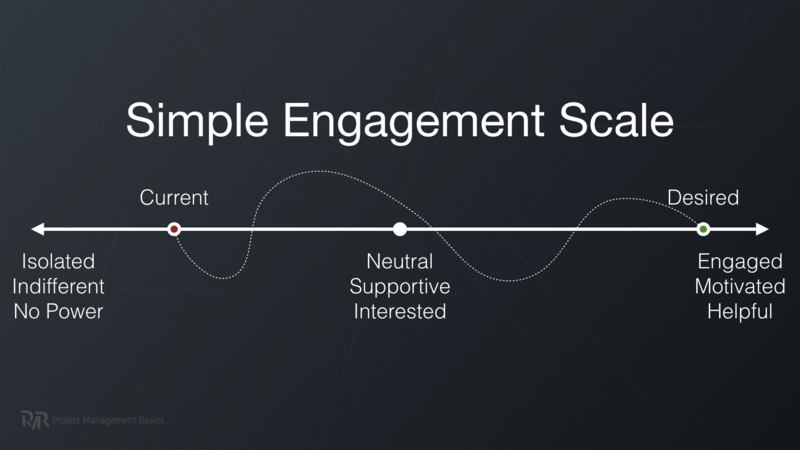 So, you have mapped the desired level of engagement for stakeholders. Well, now you need to work consistently to get the desired goal. If you expected to get an action plan to influence people, I have bad news for you. There is no such plan. It is interaction with people. They are so much different and unpredictable. During their journey toward the engagement level you set, you will have to adapt. You can’t keep to one prescribed tactic. Nevertheless, by now you know enough to understand each one of them. After that, you need to try to find the approach. A key to each separate person. If it doesn’t work – try another way. Track progress and adapt. If you liked the article, please share it on LinkedIn. 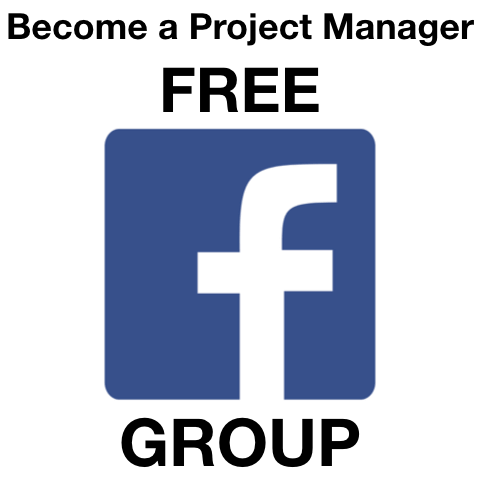 Click the Share button below.